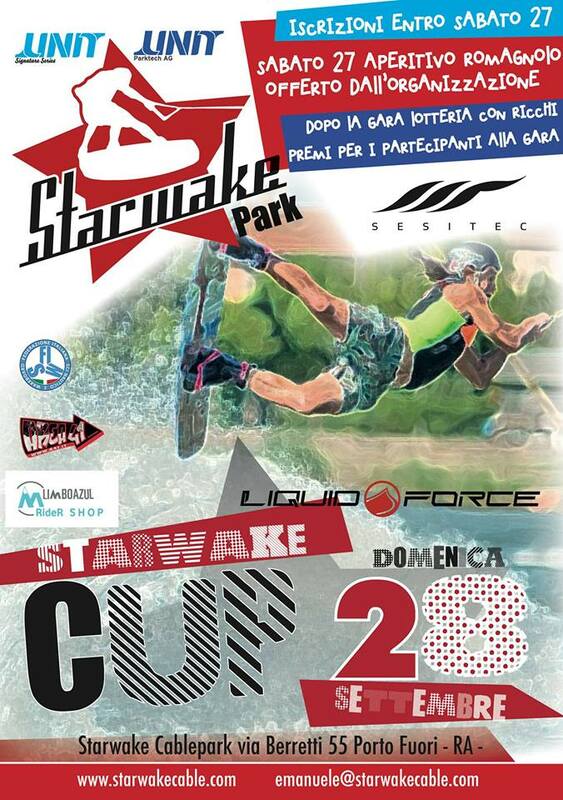 Domenica 28 Settembre si svolgerà la Starwake Cup 2014. LE ISCRIZONI ALLA GARA SONO APERTE FINO A SABATO 27 SETTEMBRE. CONTEST SUDDIVISO IN CATEGORIE WAKEBOARD PER ETA’ COME DA REGOLAMENTO IWWF, OLTRE ALLE 2 CATEGORIE OPEN PRO MEN & WOMEN. APERTA ANCHE LE CATEGORIE OPEN WAKESK8 MEN AND WAKESK8 WOMEN. GLI AIR TRICKS VALGONO PER IL PUNTEGGIO DELLE SOLE CATEGORIE PRO. 2 RUN DI GARA DA 2 GIRI CIASCUNA E CONTA LA MIGLIORE DELLE 2. A SEGUIRE IL CONTEST “THE KING OF THE KIKER”. SABATO 27 DALLE ORE 16.30 APERITIVO TIPICO ROMAGNOLO OFFERTO DALL’ORGANIZZAZIONE. DOMENICA MATTINA ORE 9.00 BREEFING PREGARA CON I GIUDICI. SARANNO PREMIATI TUTTI I PARTECIPANTI ALLA GARA: PREMIAZIONE CON MEDAGLIE PER I PODI, A SEGUIRE LOTTERIA PER TUTTI GLI ISCRITTI CON BELLISSIMI PREMI FRA CUI UNA TAVOLA DA SNOWBOARD ..
SARANNO PREMIATI ANCHE IL BEST CRASH, IL BEST POSER ED IL BEST SPRYER!!! DOPO LA GARA, GLI ISCRITTI POTRANNO GIRARE FOR FREE FINO ALLA CHIUSURA DEL CABLE.